Gum plant is a bushy biennial or perennial plant; several stems grow together to a height of 1-2 feet and bear alternate, oblong to ovate or lanceolate, sharply serrate or denticulate (the uppermost may be entire), leathery leaves. It has many leafy branches and many flower heads. Two to five yellow flower heads, about an inch across, grow in a terminal cyme; they are sticky and the bracts which surround them are rolled back; from August to September. Flowers of aromatic taste and balsamic odor. Native to, but not plentiful in, the coastal areas of California. 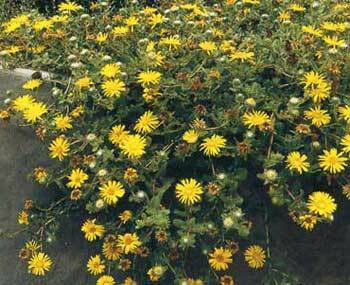 Found in open and dry areas, on roadsides and waste land and often a weed of rangeland. British Columbia to Minnesota and south to California and Texas. They used it as a cough medicine; using the upper 1/3 of the plant dried, especially the sticky buds. This was also taken for dropsy and smallpox. The boiled root was taken as a tea internally. Used in small doses, gum plant helps colds, nasal congestion, bronchial irritation, and for the spasms of whooping cough and asthma. Has been used to treat catarrhal kidney problems, iritis, indigestion, and cystitis. Externally, the tea is used as a wash for burns, rashes, blisters, and inflammations; a fluid extract, diluted with 6 to 10 parts water, can be applied to skin irritation caused by poison ivy or poison oak (soak a clean bandage, keep it moist, and change often). Used in external ulcers, impetigo, eczema and allergic dermatitis. Native Americans used the buds on the plant, dried they were used for smallpox and measles, toothache, rheumatism. Use dried leaves or flowering tops. Infusion: steep 1 tsp. dried leaves or flowering tops in 1 cup boiling water. Take 1 cup a day. Tincture of Grindelia: take 5-30 drops, as required. Gum plant tends to take up selenium compounds (a sulphur-like non-metallic element) from the soil and store them. It becomes toxic in areas where the soil is rich in selenium; do not pick it from such areas. Large doses can be poisonous; smaller doses may cause slowing of the heartbeat. Avoid in cases of low blood pressure. Because of its high resin content, it is considered hard on the kidneys and for this reason usually is used only for acute ailments.